Security Guard Management Software from GuardMetrics makes running your security guard services easier, more efficient and paper-free. It automates administrative functions so that you can spend more time building your business and giving your clients and prospects the best service possible. Security guard service businesses need modern, real-time, security guard apps that deliver GPS security guard patrol and tour tracking and mobile reporting capabilities. The GuardMetrics team seeks to partner with you to deliver on all fronts. DEMO this security guard management software app. Automated, mobile security guard management software delivers business-critical data from the guard tour field app in real-time. It tracks your mobile guards instantly when your officers scan RFID, NFC or QR codes at checkpoints, on tour or patrol, conduct DARs, or do mobile incident reporting. Guard Tour results and incident reports are sent to your site managers automatically through the mobile “Supervisor Menu” and the “Management Portal”, and through instant alerts, via email, when you wish. This allows you to deliver accurate, real time information to your clients anytime, even allowing them access to their own “Client Portal” to view their real-time reports and data, if you choose. GuardMetrics mobile Reporting app keeps your officers connected, accountable, and safe, by making it fast and simple to document any event in real-time. 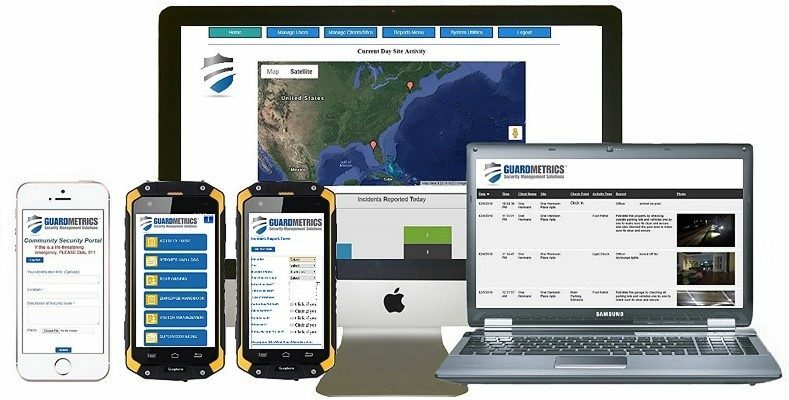 GuardMetrics Guard Tour app and Reporting systems provide a flexible interface that can be deployed on any mobile smartphone (Android or iPhone), tablet, notebook, PC, MAC or iPad. The GuardMetrics security guard management system includes an advantage that 99% of your competition cannot provide! The Community Security Portal allows an employee or resident, of your HOA, corporate, or government client, to easily send your team a security alert from any device. What better way to set your guard services apart than with an extra level of security that stakeholders can’t get from your competitors? Call and DEMO all the other excellent features available in the security guard management system apps! Bound paper post orders, stuffed in a drawer somewhere, are of no use to you or your officers when they are on patrol. Digitize your post orders so they can be easily accessed by your security guards on the fly. No more middle of the night calls from an officer that needs to know what to do in an incident, when you know the answer is in the post orders. Keep your operation simple with cost-effective security guard management software. Imagine how much more productive your security operations management will be without stacks of papers to read, sort and file. GuardMetrics security guard management software simplifies tasks for your security officers and managers, making paper clutter and lost paper-clipped-photos a thing of the past. Mobile guard patrol and tour reports are transmitted digitally and stored securely in the cloud, for easy access. Electronic reports streamline operations and allow you to optimize your staff members’ time. GuardMetrics software saves time, money and resources. Simple. Digital data sharing between officers, site supervisors and clients makes for a transparent operation that clients truly appreciate. Moving administrative tasks online makes your company run more smoothly. Collecting and reviewing digital information makes it easier to manage your security guard business – and deliver superior service. Click here to request a demo of GuardMetrics Guard Tour and Incident Reporting System.